For other uses, see Leipzig, Saskatchewan. listen)) with more than 530,000 inhabitants, is the largest city by population (the second largest being Dresden) in the federal state of Saxony, Germany. 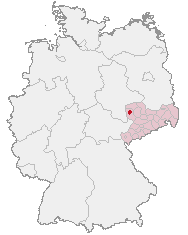 Leipzig is situated about 150 km south of Berlin at the confluence of the Weisse Elster, Pleiße, and Parthe rivers at the southerly end of the North German Plain. Leipzig later played a significant role in instigating the fall of communism in Eastern Europe, through events which took place in and around St. Nicholas Church. Since the reunification of Germany, Leipzig has undergone significant change with the restoration of some historical buildings, the demolition of others, and the development of a modern transport infrastructure. Nowadays Leipzig is an important economic centre in Germany and has many institutions and opportunities for culture and recreation including a prominent opera house and one of the most modern zoos in Europe. In 2010 Leipzig was ranked among the top 70 world's most livable cities by consulting firm Mercer in their quality of life survey. Also in 2010, Leipzig was included in the top 10 of cities to visit by the New York Times. Leipzig is derived from the Slavic word Lipsk, which means "settlement where the linden trees (British English: lime trees; U.S. English: basswood trees) stand". An older spelling of the name in English is Leipsic. There are records of commercial fishing operations on the river Pleiße in Leipzig dating back to 1305, when the Margrave Dietrich the Younger granted the fishing rights to the church and convent of St. Thomas. 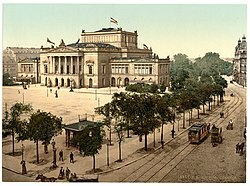 The foundation of the University of Leipzig in 1409 initiated the city's development into a centre of German law and the publishing industry, and towards being the location of the Reichsgericht (Imperial Court of Justice), and the German National Library (founded in 1912). The philosopher and mathematician Gottfried Wilhelm Leibniz was born in Leipzig in 1646, and attended the university from 1661 to 1666. The Leipzig region was the arena of the 1813 Battle of Leipzig between Napoleonic France and an allied coalition of Prussia, Russia, Austria, and Sweden. It was the largest battle in Europe prior to World War I and ended Napoleon's presence in Germany and would ultimately lead to his first exile on Elba. In 1913 the Monument to the Battle of the Nations monument celebrating the centenary of this event was completed. A terminus of the first German long distance railway to Dresden (the capital of Saxony) in 1839, Leipzig became a hub of Central European railway traffic, with Leipzig Central Station the largest terminal station by area in Europe. The train station has two grand entrance halls, the eastern one for the Royal Saxon State Railways and the western one for the Prussian state railways. Leipzig lies at the confluence of the rivers Weisse Elster, Pleiße, and Parthe, in the Leipzig Bay, on the most southerly part of the North German Plain, which is the part North European Plain in Germany. The site is characterised by swampy areas such as the Leipzig Riverside Forest, though there are also some limestone areas to the north of the city. The landscape is mostly flat though there is also some evidence of moraine and drumlins. The hottest day on record was the 9 August 1992 with a high of 38.8 °C, the coldest was the 14 January 1987 with −24.1 °C. The population of Leipzig is approximately half a million with about 11% unemployment. Before German reunification it was over 700,000. Many people of working age took the opportunity to move west to seek work and this was a contributory factor to falling birth rates. However the birth rate for 2010 was 5414, the highest since reunification. There were 5788 deaths in Leipzig in 2010, but the population increased by 4000 due to inward migration. The average age of the population is 44. Norwegian black metal band Mayhem recorded their 1993 live album at the Eiskeller club on 26 November 1990. The cover photo for Beirut's 2005 album Gulag Orkestar was, according to the sleeve notes, stolen from a Leipzig library by Zach Condon. In Football, The German Football Association (DFB) was founded in Leipzig in 1900. The city was the venue for the 2006 FIFA World Cup draw, and hosted four first-round matches and one match in the round of 16 in the Central stadium. VfB Leipzig, now 1. FC Lokomotive Leipzig, won the first national football championship in 1903. In June 2009 Red Bull entered the local football market after being denied the right to buy into FC Sachsen Leipzig in 2006. The newly founded RB Leipzig is now attempting to come up through the ranks of German football to bring Bundesliga football back to the region. Leipzig Central Station, opened in 1915, is at a junction of important north-to-south and west-to-east railway lines. The ICE train between Berlin and Munich stops in Leipzig and it takes approximately one hour from Berlin Central Station and five hours from Munich Central Station. Leipzig also has an extensive local public transport network. The city's tram and bus network is operated by the Leipziger Verkehrsbetriebe. Leipzig's tram network, at a length of 209 km (about 140 miles), is one of the longest of any German city. In the first half of the 20th century the construction of the Elster-Saale canal s, White Elster and Saale was started in Leipzig in order to connect to the network of waterways. The outbreak of the Second World War stopped most of the work, though some may have continued through the use of forced labor. The Lindenauer port was almost completed but not yet connected to the Elster-Saale and Karl-Heine canal respectively. The Leipzig rivers (White Elster, New Luppe, Pleiße, and Parthe) in the city have largely artificial river beds and are supplemented by some channels. These waterways are suitable only for small leisure boat traffic. ^ "Business America. (27 February 1989). German Democratic Republic: long history of sustained economic growth continues; 1989 may be an advantageous year to consider this market – Business Outlook Abroad: Current Reports from the Foreign Service.". Business America. 1989. http://findarticles.com/p/articles/mi_m1052/is_n4_v110/ai_7373809. Retrieved 2 October 2007. ^ Climatological Information for Leipzig. Retrieved 6 April 2012. ^ Lubow, Arthur (8 January 2006). "The New Leipzig School". The New York Times. http://www.nytimes.com/2006/01/08/magazine/08leipzig.html?_r=1&pagewanted=print. Retrieved 5 April 2010. ^ Ruf, Christoph (19 June 2009). "Buying Its Way to the Bundesliga - Red Bull Wants to Caffeinate Small Soccer Club". Spiegel Online International. Retrieved on 2 December 2010. ^ a b "Leipzig - International Relations". © 2009 Leipzig City Council, Office for European and International Affairs. http://www.leipzig.de/int/en/int_messen/partnerstaedte/. Retrieved 17 July 2009. ^ "Brno - Partnerská města" (in Czech). © 2006-2009 City of Brno. http://www.brno.cz/index.php?nav02=1985&nav01=34&nav03=1010&nav04=1016&nav05=1249&nav06=1272. Retrieved 17 July 2009. ^ "Frankfurt -Partner Cities". © 2008 Stadt Frankfurt am Main. http://www.frankfurt.de/sixcms/detail.php?id=502645. Retrieved 5 December 2008. ^ "Hanover - Twin Towns" (in German). © 2007-2009 HANNOVER.de - Offizielles Portal der Landeshauptstadt und der Region Hannover in Zusammenarbeit mit hier.de. http://www.hannover.de/de/buerger/entwicklung/partnerschaften/staedte_regionspartnerschaften/index.html. Retrieved 17 July 2009. ^ "Partner Cities of Lyon and Greater Lyon". © 2008 Mairie de Lyon. http://www.lyon.fr/vdl/sections/en/villes_partenaires/villes_partenaires_2/?aIndex=1. Retrieved 17 July 2009. ^ "Twinning Cities". City of Thessaloniki. http://www.thessalonikicity.gr/English/twinning-cities.htm. Retrieved 7 July 2009. ^ "Kraków otwarty na świat". www.krakow.pl. http://www.krakow.pl/otwarty_na_swiat/?LANG=UK&MENU=l&TYPE=ART&ART_ID=16. Retrieved 19 July 2009. ^ "Leipzig - International Relations". © 2009 Leipzig City Council, Office for European and International Affairs. http://www.leipzig.de/int/en/int_messen/partnerstaedte/krakow/. Retrieved 17 July 2009. This page uses content from the English language Wikipedia. The original content was at Leipzig. The list of authors can be seen in the page history. As with this Familypedia wiki, the content of Wikipedia is available under the Creative Commons License.